Our refurbished Intermec CN3 are the first fully rugged mobile computer to incorporate up to four wireless technologies into a compact PDA form factor, the versatile, refurbished Intermec CN3 has proven that integrated GPS and Bluetooth technologies can work together to increase efficiency and safety by enabling hands-free turn-by-turn voice navigation. Contact us today about buying, servicing, renting or selling Intermec CN3 gear! Built to survive the rigors of the road, the refurbished Intermec CN3 meets rugged, standards-based environmental specifications and provides features that meet the needs of mobile workers. The Intermec CN3’s 2.0 megapixel color camera provides a vital data validation tool, enabling workers to document proof-of-service or vehicle inspection. 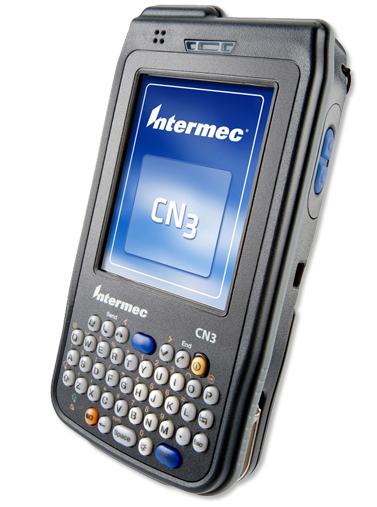 The Intermec CN3 has a touch screen display, 128 MB RAM and is available with an ultra-slim extended battery that delivers easy-to-carry, all-day power. Contact us today about buying, servicing, renting or selling Intermec CN3 gear!